Asherton Grove Condominium Association (AGCA) was founded, by Murphy Development Company (MDC) in 2010. The land was previously owned by Dominion Homes who had purchased it from George P. Benua, a local farmer and son of A.R Benua. Land was utilized for raising cattle, various crops and at times for riding horses. In the 1800’s, prior to A.R. Benua ownership, the area was known as the Kline Farm and for raising dairy cattle. Asherton Grove consists of approximately 33.84 acres and located at the Southeast corner intersection of Ulry-Lee Road and Central College Road. Located in Franklin County, it has a Westerville, OH mailing address. However, it’s provided City of Columbus services, utilities and included in Columbus School District. 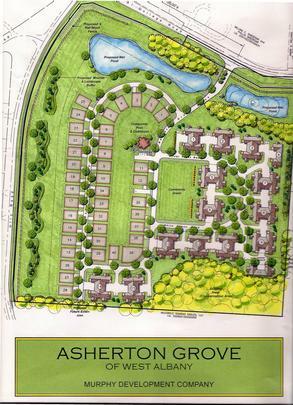 Asherton Grove’s final count of ranch-style condominiums will be 96 units…breaks down into 40 single family ’ranch-style’ condos and 56 multi-family ‘ranch-style’ condos (4 units to building). Although similar floor plans, many of the units are unique, because residents have a selection of many “options” to select from when developing their new units. Residents are very diverse group and growing as community development was completed in 2017. There are some working professionals as well as retirees that create an interesting mix and unique personality. Even though Asherton Grove is a very young community, it’s become very active due to “all hands on board presence” that aims to preserve high standards and make Asherton Grove a “family oriented, good neighbor” condo association. The AGCA Board of Directors is an integral part of Northland Community Council and NCC Development Committee, providing input into City of Columbus issues impacting the quality of life with ongoing development in the Northland area. As you enter Asherton Grove off Central College Road, there is a marvelous stone guard shack & stone signage welcoming home residents and visitors alike. A pond on either side of the entrance way, each with a fountain, trees, fence and soon sidewalks, will eventually become a very picturesque view when finished. There’s a clubhouse and swimming pool, quite active in the months it is open. There is an abundance of green space areas, making for very unique condo community layout which is very open and spacious. This will be a long term, great asset for Asherton Grove. As an active community, the Social & Activities Committee along with residents has initiated several activities & events throughout the year; several have become annual events, such “Cabin Fever Dinner” in February, “Summer Picnic Cookout & Pool Party”, “Chili Cook-off”, and “Holiday Party”. There are several activities forming… euchre and game night are held twice a month, a craft group, and some residents are teaching classes on various projects they are talented in. Other committees have formed with active resident participation to provide input and support the Board as well as the Property Manager managing the community. A monthly community update board in the clubhouse as well as a resident only website is managed by the Board. An AGCA handbook has been developed for residents to help understand condo association living, guidelines and rules. Asherton Grove Condominium Association (AGCA) is well on its way to developing a strong community and maintaining “family oriented, good neighbor” community that makes it a great place to live!